With the releasing of Patch 3.38, there are some changes made into FFXIV. Patch 3.38 brings a number of additions and refinements to the realm, including adjustments to the anima weapon and more. [3.0]:These adjustments and additions requires the purchase and registration of FFXIV Heavensward. [2.0]: These adjustments and additions don’t require the purchase of FFXIV Heavensward. [2.0][3.0]: Some elements of these adjustments and additions may require the purchase and registration of FFXIV Heavensward. [3.0] The number of Midan Gears required to exchange for High-capacity Tomestones has been reduced from 7 to 4. [3.0] Players can exchange a Mhachi Penny and Farthing for and Illuminati Deep Gobdip by speaking with Bertana in Idyllshire. [3.0] The weekly limitation on Midan Gears received upon completing Alexander - The Burden of the Son has been abolished. 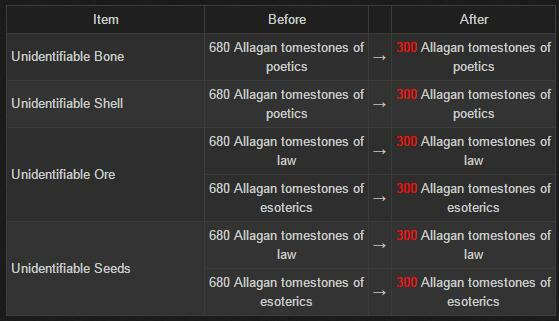 Unidentifiable Ore and Unidentifiable Seeds can be bough in exchange for Allagan Tomestones of poetics now. Unidentifiable Bone and Unidentifiable Shell can be bought in exchange for Allagaan Tomestones of law or Allagan Tomestones of esoterics now. The number of Allied Seals required to buy Unidentifiable Seeds and Unidentifiable Bone has been reduced from 1,000 to 300. The number of Tomestones required to buy the following items has been adjusted. * The high-quality version of the respective items can’t be traded in combination with normal-quality version of the same item, while they can still be traded to complete the quest. If necessary, you can use the Lower Quality subcommand to convert HQ items into NQ items before trading.